Having gout can be extremely painful, and it’s no secret that some foods can exacerbate issues related to the disease. However, did you know certain foods can help some symptoms? Here is a list of 10 foods to eat and avoid if you have gout. Beans and lentils are essential to any diet, but they're even better for someone with gout. Someone who has gout must avoid most meats and seafoods, and a diet with no protein is dangerous to your health. 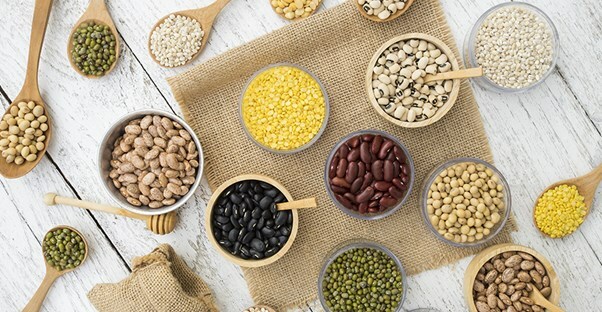 Beans and lentils are an excellent source of protein and fiber and assist those who have gout and must avoid animal products. Water is needed to be healthy, and without it, people can grow sick and even be hospitalized for dehydration. For years, water has been a home remedy to alleviate a gout attack, and it works because people who have gout have too much uric acid in their bodies. This compound quickly builds up in the body and causes pain. Water removes uric acid from the body and prevents subsequent gout attacks. Of course, most meats and seafoods are off the list, but what about milk? Milk is an indispensable part of most people’s diets. If you have gout, you can drink skim milk. Some research even proves that skim milk decreases the chance of developing gout in the first place. Another benefit is the fact that you can get protein from fat-free dairy. Everyone needs fiber for their bodies to function correctly, but fiber is especially important for those with gout. Whole grains, such as brown rice, oats, and barley, reduce inflammation and decreases pain in the process. One of the best things about whole grains is that they don’t cause spikes in your blood sugar like processed foods do, deterring future gout attacks. Some research has shown that vitamin C can help prevent gout, but it can do so much more. For someone with the disease, it can also help treat by removing excess uric acid from the body. Uric acid is what causes many symptoms that plague gout sufferers. Consume at least 1,500 mg of vitamin C daily to see decreased inflammation and pain. Seafood is detrimental to anyone who has gout because it increases the amount of uric acid in your body. Not only can uric acid cause a person to develop gout, but it can also cause someone with the disease to have more painful attacks. Avoid all seafood, if possible. Red meat can also cause gout. Worst of all, red meat is high in saturated fats. Weight loss is encouraged in those who have gout, and a high intake of saturated fats can cause weight gain. By avoiding the saturated fats in red meat, you will decrease the amount of uric acid in your body. Of course, consuming drinks and foods high in sugar can cause weight gain, but it will also increase your uric acid levels. Several studies show that drinking sugary beverages significantly increases the chance you’ll get gout. Those who drink soda, for example, have an 85% increased risk of developing gout, so it’s no wonder sugar can also make things worse. If you must drink soda, opt for diet. Alcohol, whether beer or hard liquor, can trigger gout symptoms in people who are prone to the disease. If you already have gout, it is another culprit that increases uric acid levels in your body. Drinking alcohol could cause a gout attack in as little as two days. Drinking coffee and other caffeinated drinks may give you a perk in the morning, but avoid it if you have gout. Studies show that caffeine causes pain from frequent gout attacks. It also increases the risk of having an attack by as much as 80%. Instead of coffee or tea, grab water.